I love a recipe with a story, and this one starts with "You're fired." For creative insubordination. Dorie Greenspan was the apprentice pastry chef at one of the trendiest restaurants in New York City at the time: The Soho Charcuterie. She was bored making the same two desserts over and over every day so she tweaked this cake slightly and sent it out for service. "I was fired .. for "creative insubordination" — how could I have known how angry everyone would be when, without mentioning it, I did away with the rum-soaked raisins in the chocolate cake and replaced them with Armagnac-soaked prunes!" I can only imagine that the owners of Soho Charcuterie (who closed in 1985) now regret their lack of vision and trust in such a star of the food world that Dorie became after leaving their establishment. Dorie's Chocolate Armagnac Cake is a variation on a Chocolate Whiskey Cake known as Le Doris that was created by Simone "Simca" Beck (one of Julia Child's co-authors of Mastering the Art of French Cooking, Volume I: 40th Anniversary Edition). The Chocolate Whiskey Cake appeared in Simca's cookbook, Simca's Cuisine, and it was the one served at The Soho Charcuterie. 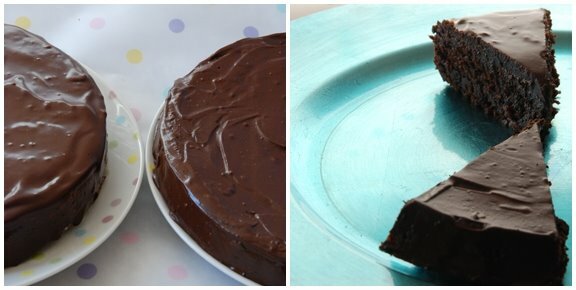 I was curious and decided to make the two versions of the cake to taste side-by-side. To see what the hubbub was about. To taste the cake worthy of firing someone for. So I found the original version of Simone Beck's recipe for Chocolate Whiskey Cake, compared it to Dorie's and basically substituted raisins for prunes and almonds for pecans. I wanted to buy Armagnac, but at $99 CAD for a bottle, I had to settle for cognac. I ended up using cognac in both versions so it's not a true taste test, but it was close enough. The result: I couldn't tell the difference. I asked my daughter who has a palate that can taste fine subtleties, and she couldn't taste the difference. I asked my husband, and he couldn't taste a difference. We couldn't tell which one had pecans and which had almonds either. If we got a bite with a prune or a raisin, we could figure out which one was which, but that was the only way, and it was so slight as to be almost undetectable. Gremolata: Why did you get fired? Another food writer, Florence Fabricante, award-winning author for The New York Times has her own version of this cake too. Her changes include increasing the quality and amount of chocolate, using brown sugar, currants instead of raisins, and sometimes almond flour instead of all-purpose flour. She also uses Irish whiskey. Every baker is a recipe hacker. I, too, use what I have available, leave out what I don't like, adjust the technique, find a unique way to present it. A recipe is a sweet muse. I saw Virtual JFK on the weekend, and it made me think about what-if scenarios. What if Dorie had used currants instead of prunes? Would she have been fired? Would she have settled into a career as a pastry chef? Would we have Baking: From My Home to Yours and bake each week through this wonderful cookbook? It's thanks to her tweaks and experimentation that we have so many beloved recipes. Cheers to her creative insubordination. You can find the recipe for Chocolate Armagnac Cake in the book Baking: From My Home to Yours by Dorie Greenspan or here. To see how the rest of the TWD group fared with this week's recipe, click here and then click on each blogger! Thanks to LyB from of And then I do the dishes who chose the recipe for this week. I didn't have two springform pans the same size so I used one springform and one small round pan. One cake was flatter than the other because of this. This almost flourless cake is intense, fudgy, rich, velvety chocolate decadence with a slight kick from the cognac. The dense chocolate is taken to an al dente stage that melts immediately on your tongue. Though delicious on its own, a whiff of whipped cream or a swirl of vanilla ice cream and a strong espresso makes it perfection. To me, that is. My daughter, on the other hand, asked after taking one bite and tasting a raisin: "What's in this?!" And then after finding out, she wondered: "Can you make it without raisins and prunes?" I'll try. Update: Now that we've had a few days to savor these cakes, I have to say that we finished the prune version first. The prunes melted into the cake, making it moister. In the raisin cake, the raisins were not subtle. If you got a bit with a raisin, it tasted like raisin and chocolate. I think if I had soaked the raisins longer, this wouldn't have happened. Visit the Armagnac region of France and sip some Armagnac. 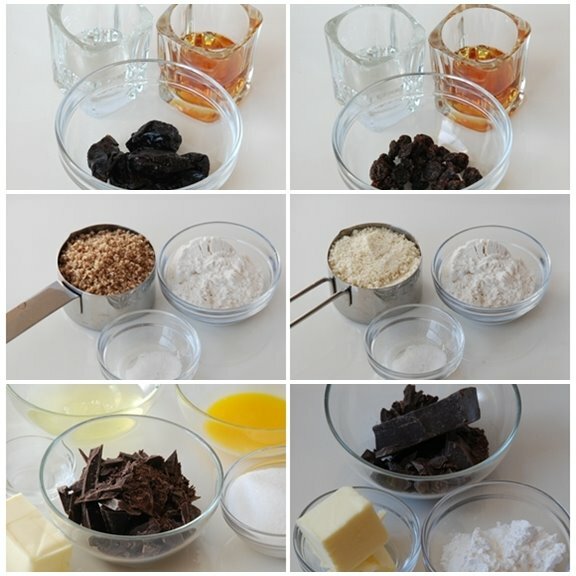 • Serious Eats "Cook the Book: Chocolate Whiskey Cake"
I am with your little girl though - no raisins or prunes would be better! Nice job again this week - I love all of your background info. Wow you were so brave !! I loved the prune version a lot !! Great write up as always! Both of your cakes look great! They both sound wonderful. Well done! I'm with your daughter - I want this cake without raisins! I loved the chocolate flavor, especially the glaze. I've made this cake a few times now but always with prunes and armagnac, I love it! I loved the prunes in the cake. My kids did not. Darn it, because flambee-ing the prunes was the funnest part! wonderful work! Am I the only one who can appreciate the fork in your picture? It's interesting that there was no difference in taste. It makes me wonder what was up at the restaurant where Dorie was fired. Could the customers really tell a difference? Anyway, your cakes look fantastic. I love a good taste test. I guess the chocolate makes it hard to tell the difference, but I'm sure both cakes were delicious! Btw, I was thinking the other day about butter and I'm not sure if it was you who did a butter review. I tried looking for that page and was unable to find it. For some reason when it came to butter (practically the most important ingredeitn) I didn't think too much of it and used whatever was on sale. It wasn't until I bought some Lactantia when I realized how much of a difference it makes in cupcakes. The selection of butter we have isn't that big, but I was wondering which brand you like using? You are very thorough! The cakes look lovely. I went with the raisin/whisky version. Tasty! I love your square shot glass. i love creative insubordination! interesting taste-test results...sounds like maybe dorie was needlessly fired! How interesting that you all couldn't taste the difference. I almost made the two versions (well almost may be an exageration. I thought about doing it for a split second), but didn't because I didn't want the extra work. Your cakes look gorgeous by the way. What a great post. I enjoyed reading the article and printed out both recipes. Lots of good info with a great story. The photos really looked yummy! Your pictures are gorgeous! Funny that you couldn't tell the difference in the two cakes. Great idea to try both fruits. I'm still trying to decide which one to use (I'm a bit behind in my baking). I'm curious how this will compare to the flourless chocolate cake I just made. So? Did I miss it... or you're not telling us which you liked best!!!??? Just lovely again! Your blog makes me drool all the time! I'm among the many that are impressed by the fact that you made both. Great job! Wow, by making both versions, you've answered my question - there isn't much difference between the two recipes! Loved your post on this --- thank you for sharing!!! Not only do I like looking at your pictures, I love the information you give. I didn't know the history behind this cake :), how interesting; talent is often criticized before it's well-received. 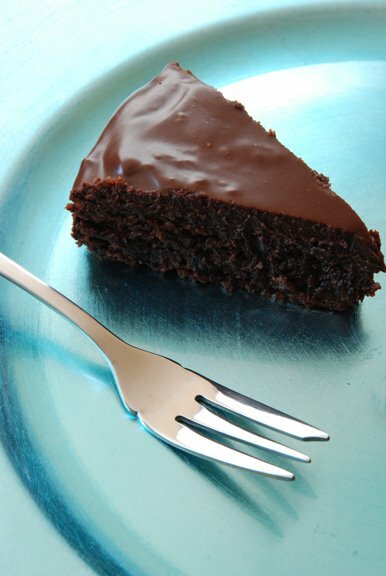 This looks so moist, the way a good chocolate cake should be! I cannot even believe you made both cakes! What a trooper you are. I struggle to get one done right. I really liked the prune version, but I think raisens would be good too. Basically I loved this cake!! well done for the taste test !!! your cakes look great !! It's not really a cake that seems to appeal to kids, all the more for us grownups! I love your investigative approach in creating a head-to-head tasting. I love the looks of the cake and also the color of your plate! I love that you did the side-by-side taste test. What a great and creative idea. The cake looks absolutely delicious. So moist and chocolatey! You are so right about the "what if's?" An amazing concept in life. thanks for sharing the wealth of info about this cake. I am fascinated with the notion that there was no discernible difference. Amazing. Either way, I really am glad you educated us about this dorie adventure. Great cake! Wow, you made both variations? Great job! This wasn't my favorite recipe but your cakes look lovely. Yours, both of them, look gorgeous and you really, really, should be cooking professionally somewhere...you are such a star at all of this. That cake disappeared faster than you can imagine around here...it was one of their favorite things we have made. They want another one soon. I should just have made them in twos like you did! Beautiful writeup - I agree, recipes are meant to be fiddled with, changed according to your tastes. I'm glad I went with the prune version though, because I really liked the moistness of the final product. Wow, both cakes look fantastic! Thanks for taste testing two different versions for us. :) And thanks for baking along with me! After Interviewing Pascal Aussignac on 'Cuisinier Gascon' I thought I had to think about what to eat with Armagnac. In Armagnac with That Rhubarb Tart or Duck Magret, Tasting and Pairing with Denis I wrote about a session I had to discover that.